As a child I was amused at the premonition of the Soothsayer when he predicted the Death of Julius Caesar, who out of sheer vanity not only discarded his advice, but also admonished him for the same. A similar analogy can be drawn to the travesty that now surrounds Uttarakhand, the sole exception being, the vanity and obliviousness of the Government has gravely pulverized the State Exchequer and costed the lives of its own denizens, as against the death of one ruler. The blame game, which is a necessary by product of every mishappening in our country, has already begun, where both the Central Government as well as the State Government are rebuking each other and their predecessors in chair for faulty policy making, ineffective implementation, absence of rescue and relief strategy, steaming constitutional debates on whether the present system should be governed under Entry 56 of the Union List or under Entry 17 of the Sate List, and the classic press release phrase “mis-governance”. What lies on the other hand of this scale is innumerable unreported deaths, devastation of public property, and over sixty thousand stranded people, who are yet to be afforded anything as remotely close to the term “relief”. India boasts of being ranked sixth in terms of largest hydel power generation capacity countries. Domestically, hydel power accounts for 1/4th of India’s dependence on energy. The Hydel Power Report of Uttarakhand published in the year 2008, categorically acclaims that the State has the potential to harness almost 20,000 MW of electricity through hydel power. Blinded with such ambitious target, the State Government failed to notice, either deliberately or otherwise, the very first objective on the same page, which has been reproduced as: “To harness the environment friendly Renewable Energy resources and enhance their contribution to the socioeconomic development of the State.” Another important objective which the State while implementing the said project, was oblivious to, is “To enhance the use of energy sources that assist in mitigating environmental pollution.” The current policies, as the CAG Report categorically points out, are aimed at aggravating and not mitigating environmental pollution, and have been a cause of the floods in and around the region. Due to the over ambitious policy of the State Government to create multiple river channels, and multiple power projects on the same tributary, a serious endangerment of environment is certainty. With over 42 Projects currently functioning, and 203 projects in construction and clearance stage, at every 6 – 7 kms stretch, there will be a dam to obstruct the flow of the river. All the projects are based on high seismic areas in and around districts chamoli, rudra prayag, pithoragarh, Almora and despite severe earth quakes in 1720, 1803, 1991, and 1999 the multiplicity of hydro power projects, without adequate counter seismic measures continue to run rogue thereby causing serious risk to the lives of the people. There is a clear enumeration of Flash Floods which would result in severe destruction to life and property in and around the low lying areas of the hills. Table Appended to the Report has further highlighted various instances wherein such flash floods have occurred previously in the same areas. No evidence to suggest that for failure to comply with the conditions of Environmental Impact Assessment, a penalty was imposed on the builders. Failure of the nodal agency to ensure submission of quarterly and half yearly compliance reports by the management. Flagrant Negligence towards Environmental and Security Concerns. The adverse impact on the ecology was further underscored by the fact that almost 4 out of 5 Power Projects have shown the complete drying up of river beds to a trickle resulting into severe impairment and devastation of the ecology, and imbalance in the water table resulting into drying up of natural aquifers in the nearby areas. According to International Standards, the minimum discharge of river downstream should be maintained at 75 % so that the aquatic life remains intact. However, the present projects are discharging downstream river by 90 % and above which results into complete devastation of the aquatic life. Faulty Pre-Feasibility Survey Reports, which gives inaccurate data for evaluation of the hydro power station, which means serious short comings in ascertaining whether the location to construct is feasible or not, questions on plant efficiency and what would be the impact of soil erosion, etc. remain in a state of serious jeopardy. As much as 38 % of the total projects which have been granted an Environmental Clearance have failed to carry out mandatory plantation. As per the Gazette notification issued by the Central Government under Sections 2 and 3 of the Environment Protection Act, 1986, the area surrounding the river Bhagirathi from Gaumukh to Uttarkashi, which is 135 kms stretch, was declared to be “eco sensitive area”. A total area of about 4179.59 sq km came under the eco-sensitive zone. This will impose restrictions on quarrying, commissioning hydropower projects on Bhagirathi, and construction of roads in the prohibited area. Besides, it will impose a ban on felling of trees and setting up of factories to manufacture furniture and other wooden items. For the purposes of effective implementation, the State Government, with the help of the local NGO’s and people was mandated to formulate a Zonal Master Plan surrounding the area, whereby every hydel power which is below 20 MW of Power Generation Capacity had to take a clearance from the State Ministry. However, the State Government opposed the said notification in May as they were not “consulted” before this policy was formulated; among concerns voiced by the citizens that an embargo on development would send them back to the Stone Age, which in reality was not what the notification envisaged. This mutual blame game and inter-ministerial trifles have led to such travesty. 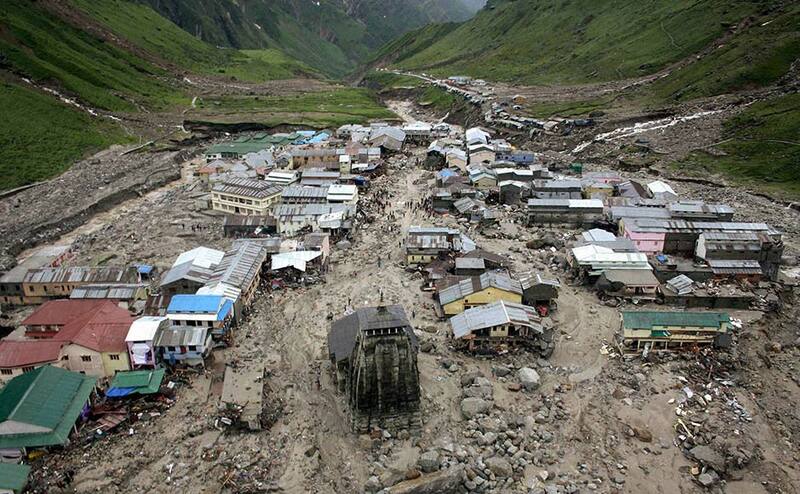 Today the very area surrounding Bhagirathi and parts of Uttarkashi are the worst hit areas of the State. Another notification issued by the Central Government warrants deliberation. It was mandated that before sanctioning the projects, or before expanding or modernizing hitherto existing projects, it was obligatory to procure an Environmental Impact Assessment Clearance from the Central Government and the State Government. Every Hydel Power project was subjected to the same strictures as have been mandated under Section 3(1) and Section 3(2) (v) of the Environment Protection Act, 1986. Such an EIA has to be in conformity with the Standards laid down by the National Environment Policy, and the guidelines that have been made under Rule 5 of the Environment Protection Rules. Screening wherein the projects are divided into two categories, those to be assessed by the Central Government (Category A Projects which are over and above 25 MW capacity power projects), and those to be assessed by the State Government (Under 25 MW Capacity Power Projects). Scoping by which the Expert Committee determines on detailed concerns (current and probable) regarding Environmental Depletion or damage, at which stage the Committee is empowered to allow or reject the application seeking commencement of the project. Public Consultation which provides for a public consultation held in the auspices of the site, obtain responses of all stake holders, villagers, etc. in writing and to be supervised by the State Pollution Control Board, but which specifically excludes “modernization of irrigation projects” out of its domain. Appraisal which means the detailed scrutiny by the Expert Appraisal Committee or State Level Expert Appraisal Committee of the application and other documents like the Final EIA report, outcome of the public consultations including public hearing proceedings, submitted by the applicant to the regulatory authority concerned for grant of environmental clearance. In addition to the aforementioned checks and balances, there is a periodic Post Environment Clearance monitoring which are to be submitted on a half yearly basis by the management. This provides a very rosy picture of the law that governs such clearances; however the reality is far from such notion. For instance, according to the Report of the Comptroller and Auditor General of India, as much as 38 % of the total industries and projects functioning in the area, and which have received a green signal to operate, have not complied with the mandatory plantation of trees in and around the site. This has resulted into serious deforestation in the hilly areas, which results into soil erosion. Himalayas being young fold mountains, have a very unstable soil compaction, as compared to other mountain ranges, because of which soil erosion can assume cataclysmic proportions, it is also the reason why rivers are changing their natural course and cutting deep crevices in the hills, wreaking havoc amongst those who stand in its way. This is one perpetual question, which warrants a sordid introspection. Reports have also suggested that illegal construction of motels, rest houses, guest houses, hotels and restaurants have been made in the river bed, whereas a notification issued by the State Government clearly prohibits any illegal construction in or around 100 metres from the river bed. This is supplementary to the damage that has already been carried out by the Government. Media reports further stipulate that there was no effective functioning authority in the name of “State Disaster Management Authority”. The moot question that now faces us is whether this calamity was “natural” at all, or was it brought about by our own fallacies, inactions, deliberate obliviousness, and negligence. History is replete with instances of civilizations crashing under the might of Natural Forces, and with the present rate of depletion, the future of the Upper Gangetic Basin and the Himalayas hangs in a very delicate balance.